Build predictive models, score leads, generate prospect lists, analyze marketing data and append consumer and business data. Looking for the decision makers to buy your products or services? Introducing Targeted Business Lists that get you directly to the people who make the buying decisions. Tap into the predictive power of LifeData® and supercharge your marketing efforts. 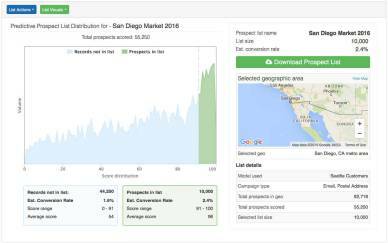 Datafinder helps you improve your marketing efficiencies by up to 40% by prioritizing leads that are most likely to convert. 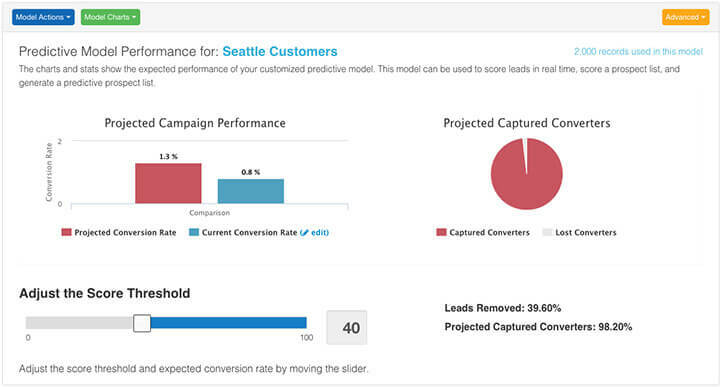 Datafinder’s self serve predictive lead score is a SaaS based service that incorporates Lifedata® and machine learning to quickly score leads, empowering you to focus on prospects most likely to buy your products or services. Datafinder’s automated Predictive List Builder uses LifeData® and machine learning to produce customized lists of prospects who are more likely to purchase your product or service. Datafinder helps businesses of all sizes better understand and connect with their customers, engage new prospects and increase revenue. We have over a trillion Consumer LifeData® attributes and over 50 billion buisness firmographic attributes including: contact data, demographic data, financial data, social data, activity & interest data, email addresses and mobile phone numbers. Add email address or reverse email address information to your customer or prospect list. Validate email addresses on your customer or prospect lists.